Tiger Swan infiltrators and provocateurs are identified in a new article. Active and retired military were infiltrators and provocateurs hired, with the goal of creating conflict to prolong lucrative security contracts. TigerSwan's lead provocateur retired Delta Force Sgt. Major John Porter pretended to be a water protector, calling out on his radio for Warriors to come to the North Bridge. There, water protectors were shot with rubber bullets, tear gas and water cannons in below freezing temperatures on Nov. 20, 2016. 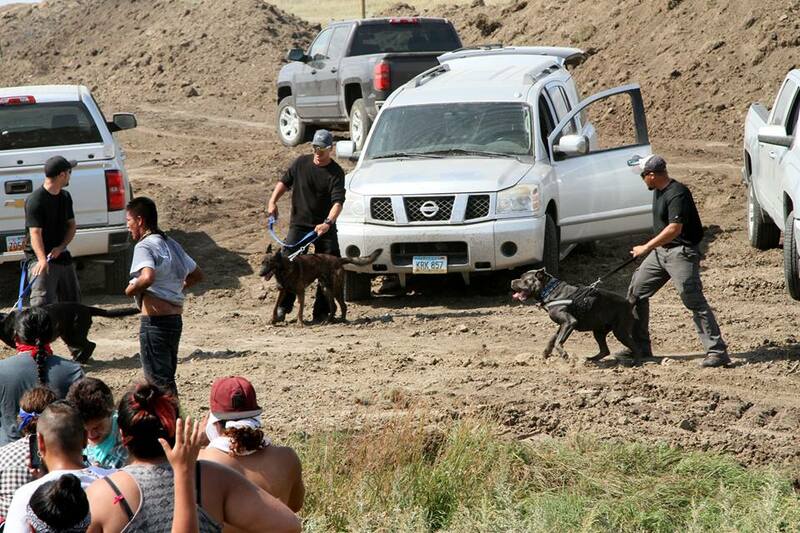 Many water protectors were critically injured. Among those exposed in the article is Landon Steele, shown below in chart, who was in camp and denied being a security operative. Steele was a contractor for Silverton security, and his dog was a bomb detecting canine. 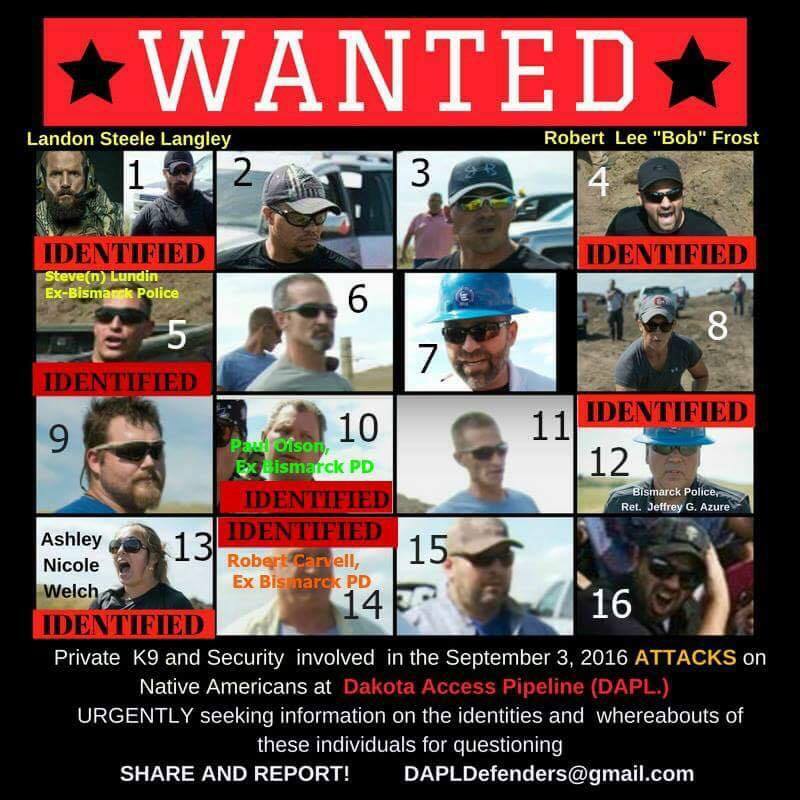 Sept. 30, 2016 -- This article identifying those responsible for siccing vicious dogs on the water protectors on Sept. 3 has been updated. 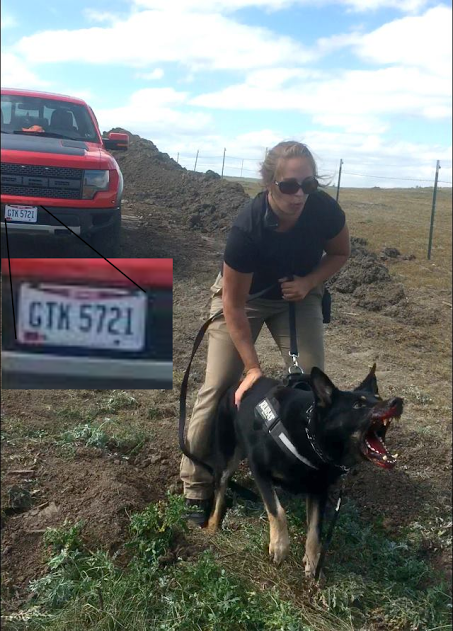 Since North Dakota officials seem to be having difficulty identifying these dog handlers, the online community has been doing it. Robert Lee Frost, owner of Frost Kennels in Ohio, was identified by his red truck plates at the scene by one reader. 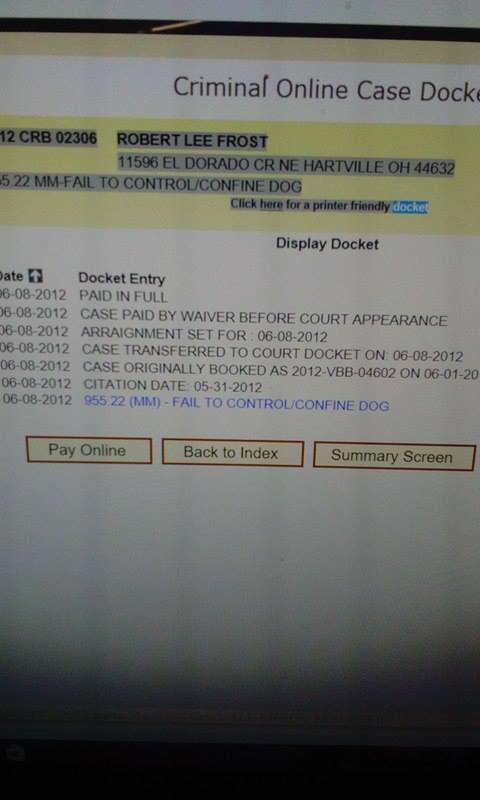 Now his criminal charge for failure to control a dog in 2012 has been added. Four of those acting as DAPL security guards on that day -- when the dogs attacked and people were pepper sprayed while defending the burial places -- have been identified as former Bismarck police officers. 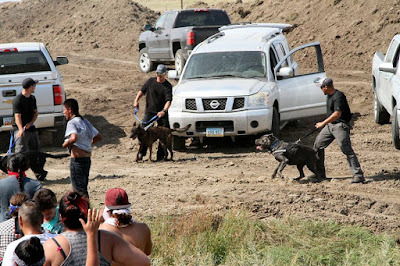 CANNON BALL, North Dakota -- North Dakota refuses to charge the Dakota Access Pipeline security guards and dog handlers responsible for the vicious attack on Native Americans who were protecting ancestral graves on Sept. 3. 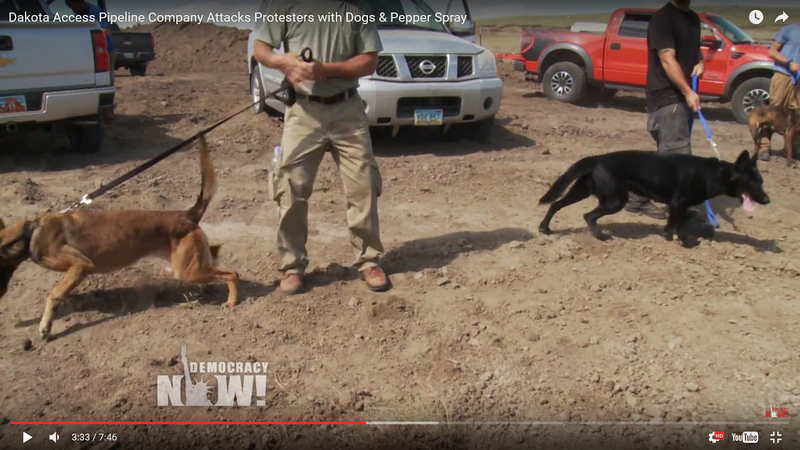 While protecting the attackers, North Dakota has charged two persons in the media with criminal trespass, Amy Goodman of Democracy Now! and Cody Hall, Lakota spokesperson for the Red Warrior Camp at Standing Rock Camp. Cody Hall was released on Monday after spending four days in jail on the two misdemeanor charges, simply for being present. Hall said they tried to break him down in jail. As shown above, the online community is now identifying those responsible for siccing vicious dogs on women and children. 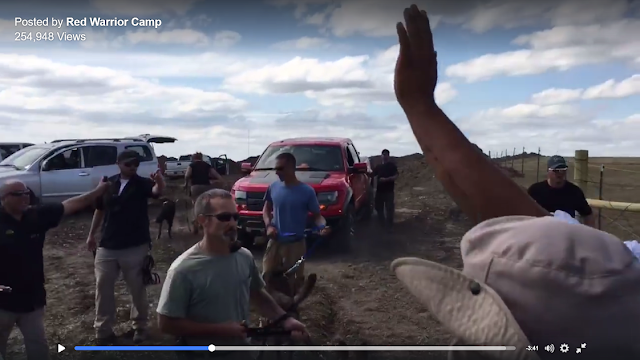 UPDATE: After Democracy Now!’s broadcast, Torchlight founder Eric Kirsch confirmed in a Facebook post that Landon Steele was on the pipeline site in North Dakota and is a Torchlight advisor, but wrote "Mr. Steele was not on the job for Torchlight in ND." Kirsch also contacted Democracy Now! and stated "Torchlight is not involved in any capacity in ND." Landon Steele was identified as one of those present, but is not shown in the video using his dog to attack. He is a U.S. veteran and paramilitary. 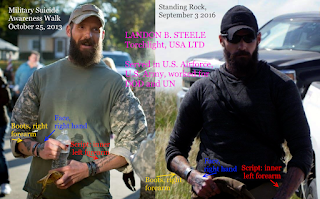 Landon Steele, shown in the two photos above, was identified using information on the Torchlight USA, LLC. website. "Landon Steele was the heavily bearded man with the brindle and white pit bull that left in the silver Silverado very early on. He and the driver (the blue Cane Corso handler) bolted as soon as crowds and cameras came out," a reader said. Torchlight has denied any involvement. Torchlight said Steele was present, but was not involved in the attack by dogs. As for Torchlight, the husband of Sarah Palin's daughter Bristol Palin, is one of the other board members of Torchlight. His name is Dakota Meyer. The license plates on one vehicle at the scene exposed the fact that the attack dogs were from an Ohio attack dog corporation owned by Edward William Frost, Frost Kennel in Ohio. 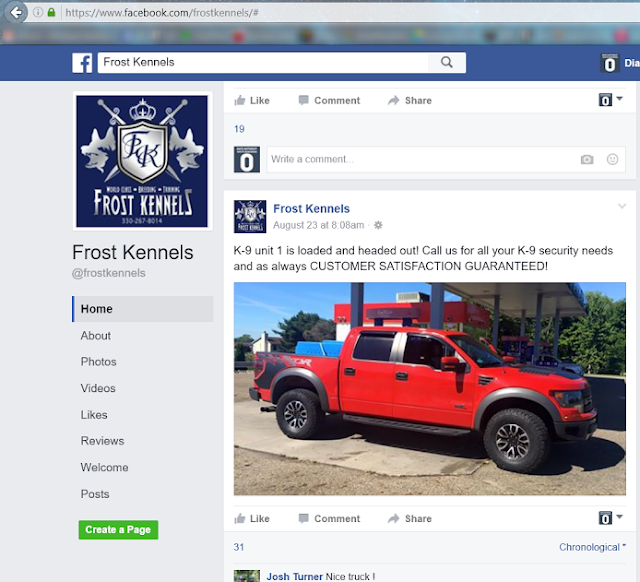 After being exposed by a Censored News reader, Frost Kennel confirmed his company was present. Frost denied the attack and injuries, and said they were just patrolling the area. 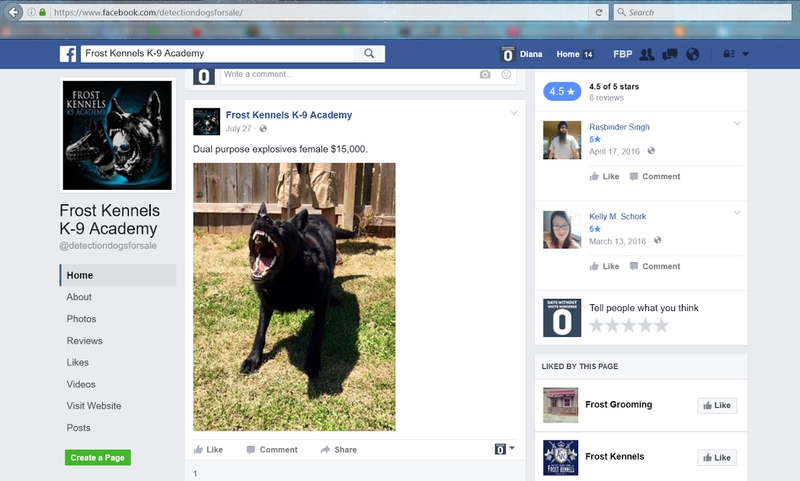 In the photo below, Frost is standing in the background, as one of the Frost Kennel dog handlers is being attacked by one of their own dogs. 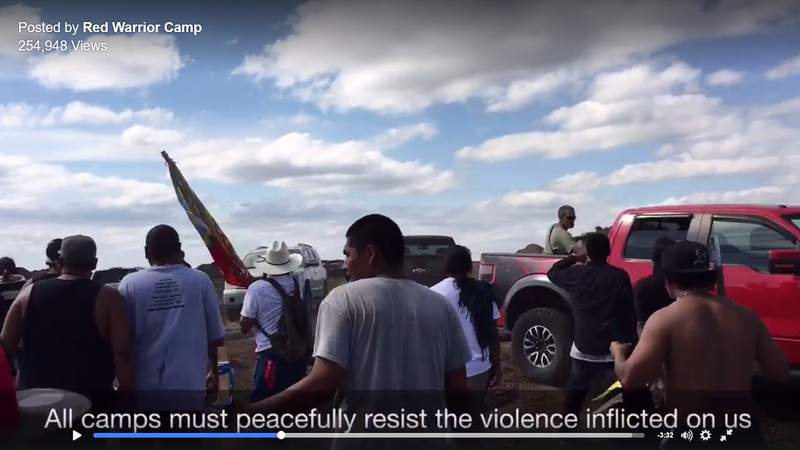 On Saturday, six persons, Native Americans and supporters, were bitten by dogs as they defended the burial place of chiefs and important cultural items, as bulldozers were ripping through the ground in violation of federal laws protecting Native American burial places. Those bitten by the dogs included a pregnant woman and child. The protectors were also maced, and some assaulted. 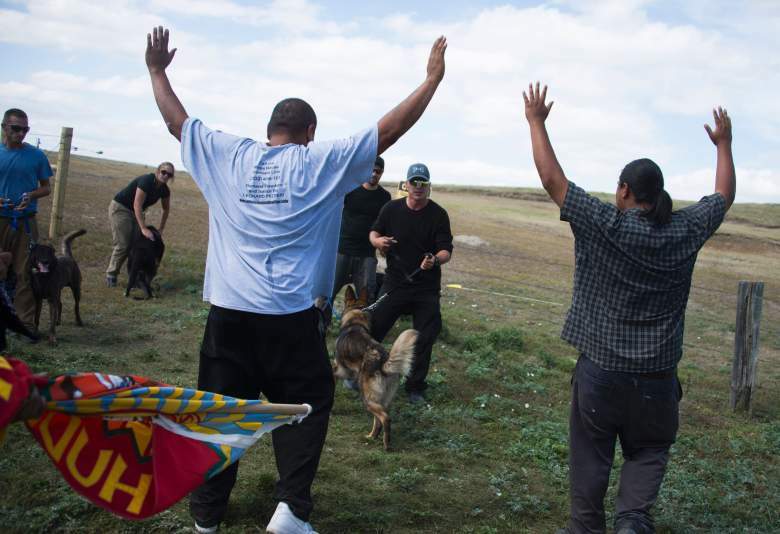 However, the Morton County Sheriff's Office released a statement of lies about those defending the burial site. Those lies were circulated by many in the mainstream media, including The Associated Press. Democracy Now was present and broadcast the video showing the Native Americans and supporters that were protecting the site were attacked. 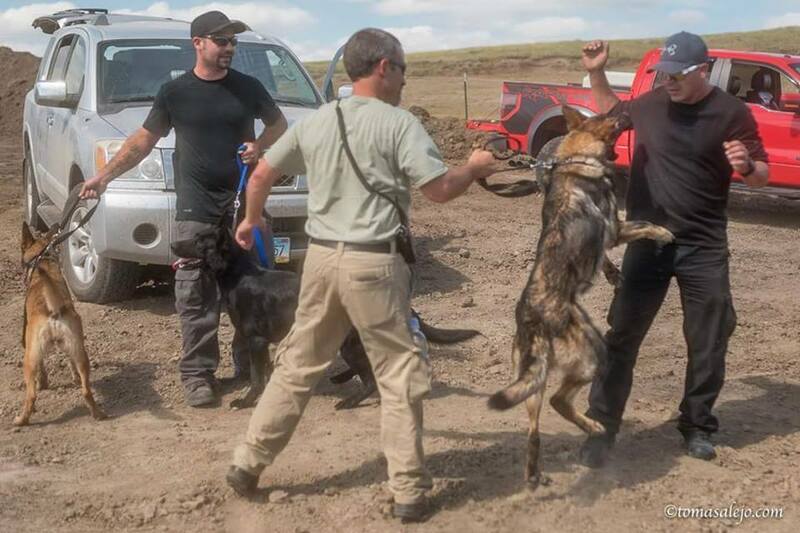 North Dakota officials investigating the attack on burial place protectors told Bismarck Tribune that they could not identify the dog handlers responsible in the attack. However, the officials need only to track the license plates of the vehicles, the way our reader did. This will lead them to Frost Kennels of Ohio. Others were identified by tattoos and markings on their vehicles, and their bragging on Facebook, which confirmed their role. A simple search then reveals those with felony charges. Their Facebook posts led our readers to identify an entire network, revealing others identities, in a large network of former military. Each time they attack this article at Censored News, more people in this network are identified. The most common items appearing in their photos are beer, boots, beards and weapons. He also owns the company that gets State funding to do Aerial Monitoring. with a criminal count of not controlling a dog in 2012. Mercs have been against everyone's best interest since the British, French, Dutch, Russians and Spaniards invaded the Americas. The use of them should be an automatic disqualification of doing business anywhere in the USA. Landon is big hearted combat medic and his dog is a service dog (for vets) not an attack dog. Dogs can be trained for cadavers, arson, security, emotional suppoert etc. I stand behind the Tribes 100% and plan to venture back to DC to stand with them. I know Landon and having interacted with his dog, I don't think he's there in the capacity that this blog portrays him to be. (Hopefully I'm not wrong) I recently invited him to a annual pow wow in MD...which he was sad to have missed. 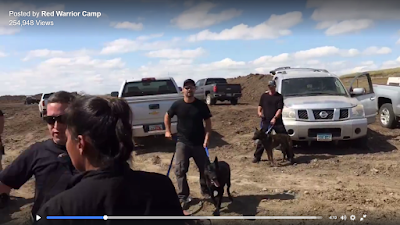 Did Guard on Site at Saturday's Standoff at Standing Rock Work with Private Security Co. Torchlight? More details may have emerged about the standoff on Saturday. While it is not yet known which security company working for Dakota Access was responsible for attacking Native Americans with dogs and pepper spray, it has emerged that one of the security guards on site may be an Air Force and Army veteran who now works with a security company called Torchlight USA, LLC. Torchlight was founded by a former Marine officer, Eric Kirsch, whose LinkedIn profile says he went on to do private consulting for the State Department. Internal company documents say Torchlight provides "consulting in direct support to US Government, NATO Coalition, and Corporate initiatives." The security guard, Landon Steele, is listed on Torchlight’s website as a company officer and adviser. He appears to be the same man photographed multiple times at the site of Saturday’s conflict, at times holding a dog. please tell us how the wounded child is doing. this would be the most powerful narrative on media. Paint a bulldozer-- warrant issued for arrest. Why are they not being held accountable? Why has the media not reported on this AT ALL?? You can add license plate GTK 5721 Kurt Meir out of PA along with Ashley Nicole Welsh of Ohio to your list. Both confirmed by photo and PA dept. of motor vehicles. Did you also notice he and his dog didn't do anything except stand there? It's called government cover-up. Since Obama took office government over reach has multiplied astronomically. And you can bet the Clinton foundation probably has their hands in this too all to make a buck. Our elected officials haven't worked for the American people in probably half a century or more. There are exceptions of course, like Trey Gowdy. Some of the American people have slowly finally started to take notice of the crap Washington has been doing to our country. To our people. The Constitution originally placed it's citizens at the top of the so called food chain, and government at the bottom. It has since flipped and our government has placed itself at the top, and us at the bottom. How socialistically communist of them. truthfully, as long as police can shoot anyones peaceful dog for any reason, I think that being in fear of ones life would be reason enough to shoot these attack dogs. they are not police dogs and are visious and danger.. a bullet to their heads every time they are brought out to be used against people on their own lands . ( rez is not public property) IS fair. 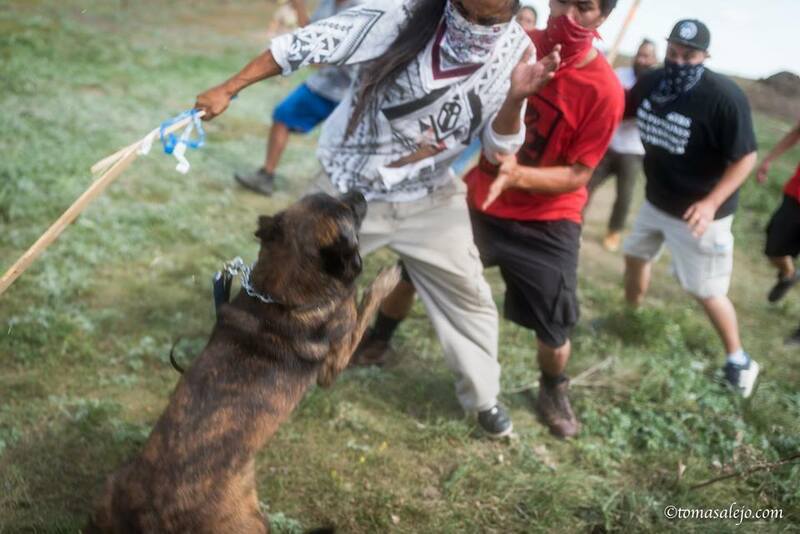 peaceful protesting has its place yes but self protection against attack dogs needs to happen.. 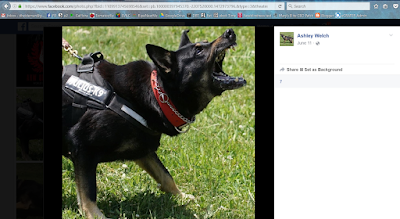 Sadly, Foxie, you can't just shoot a dog at a peaceful protest, because then it becomes a violent protest. Let's hope this so-called 'security' company faces criminal charges. Obviously they are runnin' scared now if they've deleted their website and they are cowards too who are in hiding...trying to deny what the cameras show: they were there!!! I personally know Landon Steele. He helps veteran in Minneapolis, so long as there is publicity for him. He is extremely different with veterans in private. Beware of him. Bearded Torchlight employee Landon Steele is also a featured member on the "Minneapolis Beard & Mustache Club) page, on its facebok banner photo as well as in its website's member section. After what the USgovt has done to native americans its time they stand up for their lands...the dollar is tied to oil so this pipeline will be built but does the govr or dakota acess whatever they are have the resourcea to patrol every foot once its built? I think the NA should take it out. It might be illegal but it is just. Good job Anonymous. Keep up the good work. Yes! GOOD WORK! MANY PRAYERS! He apparently hates Black Lives Matter as well. He talks in one post about how they are "racist". And you can see him posing with a Cop for a picture. No wonder they won't press charges. Paramilitary Terrorists supporting other Paramilitary Terrorists. I wonder if a court order could be issued to compel the company to give up their names. I took extensive video of Landon, which can be see at: https://youtu.be/7XpjO_Gw7Ag. He had complete control of his dog, his dog was the only one not acting aggressively. Landon was not see on site during the dog bites. I believe he left as soon as he realized the situation, which I doubt the DALP informed them completely of. But all other security clearly did not know how to control their dogs or were encouraging their dogs to attach (Ashley). But, he's there. Regardless of leaving. 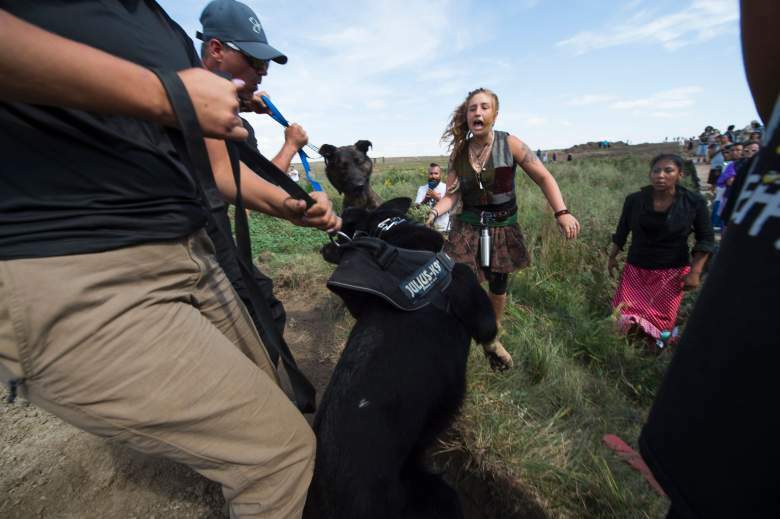 He was there and he didn't speak up, or join the water protectors.